In a sign that things have come full circle since Barack Obama left the White House, some journalists are now pointedly noting how often President Trump has hit the links. President Obama was heavily criticized by Republicans – including President Trump – for spending too much time on the golf course. Zeke Miller of “Time” got the ball rolling over the weekend with, appropriately enough, a tweet on Sunday. “[White House Deputy Press Secretary] @SHSanders45 confirms POTUS played ‘a couple of holes’ today and yesterday,” Miller informed the twitterverse. Next, The Hill teed up a round that looked at Trump’s golfing as president more closely, noting that Trump had played golf “for the third weekend in a row.” Two of those weekend golf outings were at Trump’s Mar-a-Lago resort while one was at the Trump International Golf Club in West Palm Beach. Donald Trump has been president for five weekends. 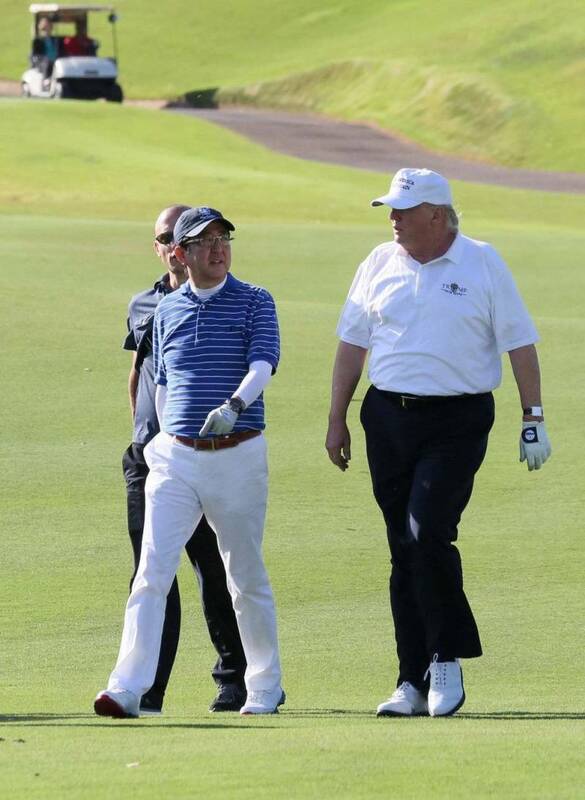 The Hill does note that last weekend, Trump played with Japanese Prime Minister Shinzo Abe in what could be termed as a business meeting on the golf course. President Trump is undoubtedly practiced in the art of closing deals on the golf course, a time honored business tradition. Over the past few weeks, the New York Times, the Washington Post, Politico and NPR have all run articles pointing out the inconsistency between campaign rhetoric and presidential behavior. Windsor Mann of USA Today saw the glass as half full: “This is great news, particularly if you hate Trump’s politics. The more time he spends playing golf, the less time he has to play president.” Trump responded to the critics with another round of golf. Data was unavailable to handicap the golfing habits of Trump and Obama at only a month into his presidency, however Golf Digest did analyze the previous duffer-in-chief’s golf habits. Barack Obama played 306 rounds as president, which translates into 38 rounds per year or about 13 holes per week. While this sets a high bar for Trump to beat, it falls far short of the estimated 1,200 rounds played by President Woodrow Wilson or the 800 by President Eisenhower. The Resurgent has noted in the past that Donald Trump and Barack Obama have many similarities. The love of golf and the desire to hit the links in Golf Cart One seems to be another thing that the two men have in common. Hopefully, President Trump will learn from the mistakes that so often put his predecessor in the rough. As with much of the partisan criticism of President Trump, it mirrors critiques of President Obama from the right. That the two parties are reversing many of their opinions on presidential behavior is par for the course. How's that voter fraud investigation going?